Best Nightstand Height: How Tall Should a Nightstand Be? Because it's often tied to the height of the mattress, there is no standard nightstand height. In general, it is easier to raise your arms than to lower them when you are in bed. With that in mind, the rule of thumb is to have your nightstand level with the top of the mattress or within two to six inches higher. However, personal preference plays a big role. Some people like their nightstands to be lower than the bed. Most commercially made nightstands are between 24 and 28 inches tall, corresponding to the average mattress height of 25 inches. This nightstand height alleviates the need for people who are standing up to bend over when reaching for items. 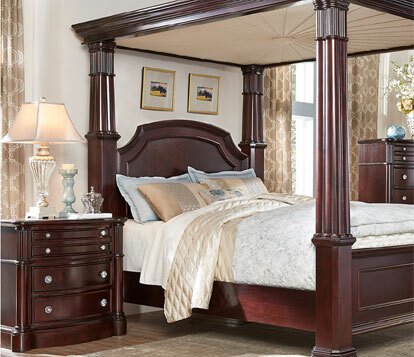 However, since mattresses can be as low as 18 inches on a platform bed or as high as 36 inches on a canopy bed, there is demand for a variety of nightstand dimensions. Which nightstand will be the right fit for your bedroom can also depend on the room's decor. For example, modern design is typically minimalist with clean lines that air out a room and make it look larger. A lower nightstand would work well in this environment. In traditional bedrooms, the height of the nightstand can be greater. Something simple, like a Shaker piece with minimal trim and detailing, is usually shorter than a more ornate nightstand in a Victorian or French Provincial style. A lot of small items can gather around a bed, from TV remotes and books to eyeglasses, cell phones, pill bottles, and water glasses. For this reason, it's wise to consider a bedside table with drawers or shelves for storage. Bedrooms with king beds can get away with something bulkier like a double-door cabinet. On the smaller end of the spectrum, consider a slim table with a lot of leg to complement a twin bed. If there will be two nightstands in the room, don't feel the need to match them. So, how tall should a nightstand be? As long as some element ties them together, like height relative to the bed, color, or material, feel free to mix and match nightstand dimensions and styles.